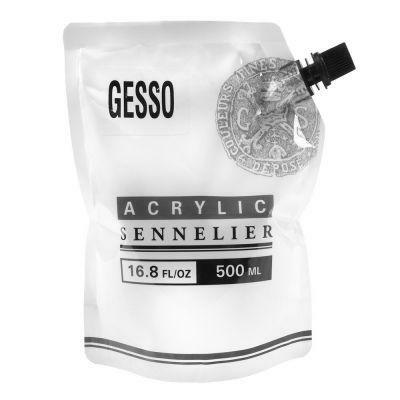 Sennelier Abstract Acrylic Gesso is a white universal primer that provides good coverage and can be applied to non-oily painting surfaces such as canvas, paper and wood. For canvases, a sizing coat is necessary before application of the Gesso primer. It can be used as it is or diluted with water (80/90% Gesso to 20/10% water according to the desired consistency. It can be applied in its natural white or tinted by pre-mixing it with Sennelier acrylic colours. It penetrates the surface and allows good paint adhesion. Sennelier gesso is suitable for many techniques; acrylic, oil, watercolour, tempera, egg tempera, casein and gouache. For acrylic, one layer is sufficient. For oil, two layers are recommended. Now available in 120ml and 500ml pouches.